The next set in the new Creator mini-series is a Power Digger that has some cool alternate builds. I mentioned last week how I feel that the alternate builds are sort of meh. But the Power Digger has two alternate builds which are harmonious with the main build. For starters, you build a digger. 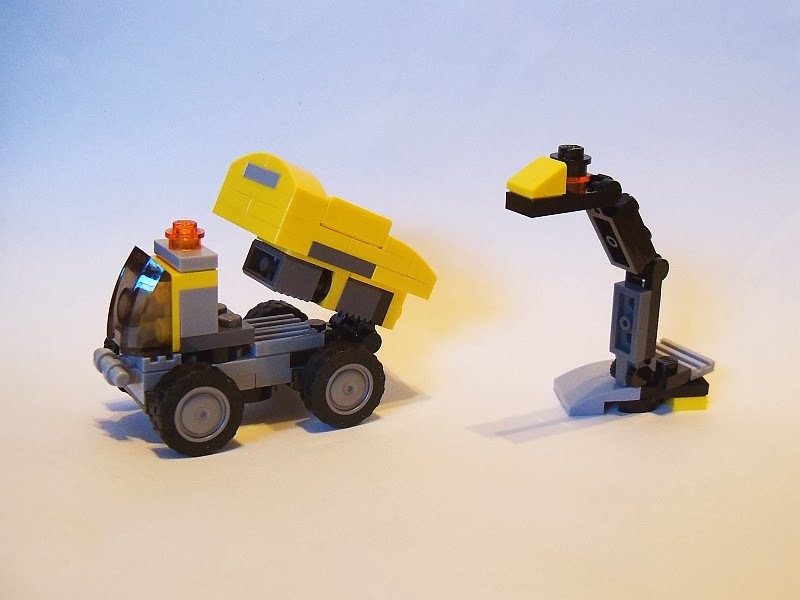 Alternate build 2 is a wheeled front end loader and alternate build 3 is a dump truck. All very symbiotic indeed! I had originally purchased jut one of this set. But after staring at the alternate build pics, I figured it would be worth while to have two more. So on one of my increasingly frequent visits to the inconvenient LEGO store, I grabbed two more. There were none on the shelf but there was a box of them behind the counter. Several were gone already. I inquired about and received two more. Apparently these little things are hot. And then a strange coincidence occurred to me. I had three of these sets in hand and I have three children. Why not let each of them build one of models and we'll play test them? What a great dad I am. And so we commenced. The three chillens' easily picked different ones and started building. The 7 year old built the front end loader. The 5 year old built the power digger. And the 2 year old assembled the wheels to the dump truck and called it good. (Daddy got to build the rest of it). We then played construction site for a while. This consisted mostly of two year old backing up his truck and saying "beep, beep, beep!" Meanwhile the girls played "hi" wherein their construction vehicles talked to each other. 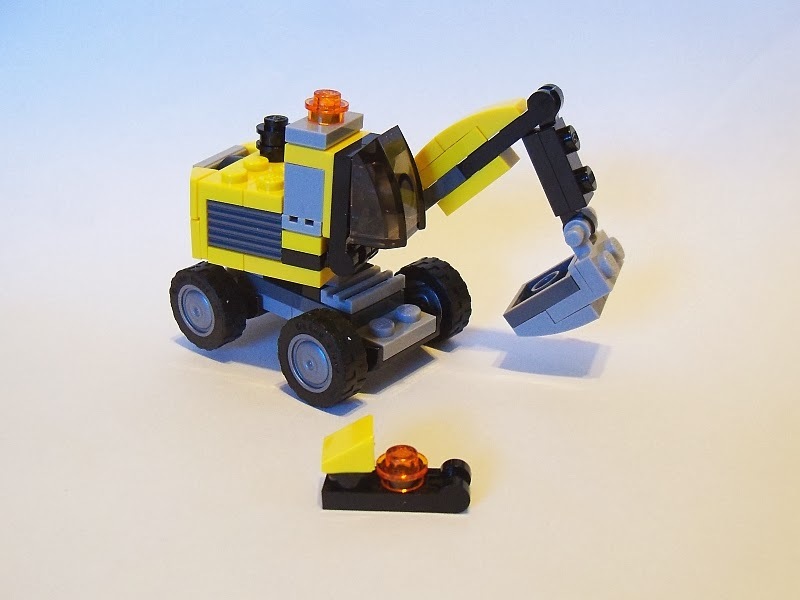 The power digger is the main model for this build and is a cute little representation. 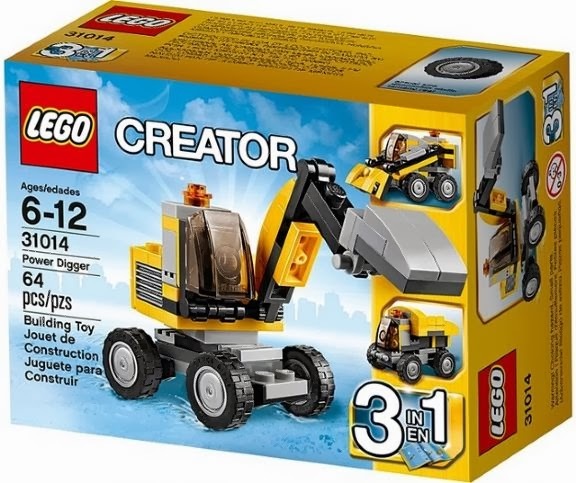 I was immediately reminded of the excavator from the mining series set 4203. There are some fairly common SNOT techniques but they are used well. One of my favorite is to use a clip and handle technique to attach the cab on top of a tile. Tiles are studless, mind you. Play is pretty good but little hands that are still learning fine fine motor skills keep popping the arm off. Next was the dump truck. There's quite a bit if chubbyness (chibi?) in this guy. The bed itself is shallow and sits in a fat built up assembly to allow for a tipping mechanism. But it's very sturdy. Except when the 2 year old is allowed to vroom it throughout the house and separates it into its molecular elements. Then daddy's a little irritated. Since it is not the main build, I used the numerous extra parts to build something. 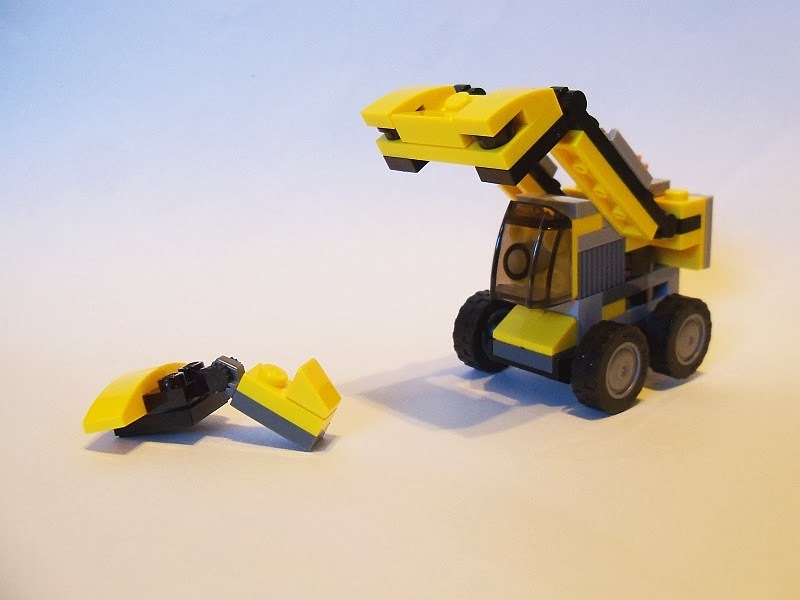 Most of the parts were articulated in nature so I ended up with a stationary digger. Or a construction serpent. The front end loader is the stoutest one of them all. The arms to the bucket are connected behind the cab allowing a large range of motion. The only drawback to this model is that arms can come down and rest on the tires. However it doesn't seem to hinder the tires from turning, even if you force the arm down. The 7 year old followed my lead with the extra parts and built a construction pelican. He carries concrete in his mouth. I'm much more amenable to this set than last week's helicopter. It's the wheels mostly. This set has a lovely assortment of yellow pieces, especially the new baby bow now available in near 100 sets. If price per part is what you're interested in then this comes out tops with 64 + 4 pieces for $5 which equals a paltry 7c each. But the parts are even smaller than the helicopter so is that fair? Perhaps we should be thinking price per ounce? LEGO has hit an instant win with three dashing models that work well together. They've almost guaranteed that you will be spending the money on three copies just to have your own micro construction site. I would say it's money well spent. 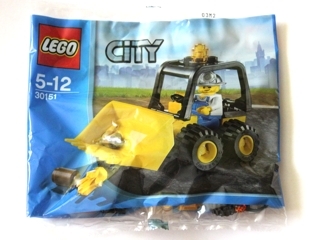 In a continuation of last week's review we'll look at the other polybag in the Mining series, the Mining Quad. 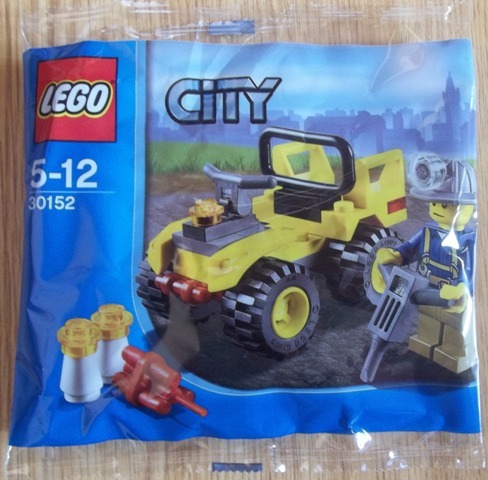 With the pre-existing inclusion of 4200 Mining 4x4 the designers must have been stretching to fill another polybag. Maybe something tracked would have broken the monotony. But I like little wheeled things so I was immediately drawn to this. You get the vehicle, a miner with hardhat, and the obligatory dynamite. My only eyebrow raise is that the wheels used on this are the same size as the ones used on the fire engine. Next to each other they look silly. Actually the fire engine looks silly in my opinion but that's not why we're here. The miner is one of the four characters that are available from 4204 The Mine. All other miners in the other sets are a replica of these four. But at least there's some variety of clothes and heads to play mix and match and make more miners. Four different pants x 4 different shirts x 4 different heads = 64 different possible hard working minifigs. But every group of 16 will have the same face. Might be a little creepy if you got that far. Oh yeah, the Quad. Yes, it is. It's certainly more play hardy than the dozer. It also has a few accessories as well so the kids no longer have to fight over who gets to play with the jackhammer. And more dynamite is always good. It was and still remains a Target $3.99 exclusive. With 42 pieces (counting the extras and the minifig as pieces) it hits our happy little 10c per part price. And it vrooms well without falling apart. Strip away the tools and it's a decent all-purpose quad. And of course being LEGO you could change it up in several different ways for a fleet of unique vehicles. Get a few, why not? When LEGO's Mining series was introduced last year I was rather excited about it. I was finally running a self sustaining hobby that could pay for my own LEGO products instead of taking that money from the mortgage or diaper fund. I planned to collect every single set within the series. Thanks to the Wal*Mart gaffe I was able to pick up 4204 The Mine for a paltry $39.99. I later found 4202 Mining Truck on sale (now retired) with a stacked coupon for around $22. I am still waiting for a deal on 4203 Excavator Transporter. I watched polybag release announcements like a hawk and finally found the little Mining Dozer for $3.99 at Target. We drove by on the way home from elsewhere and I asked my wife to go in and buy it. The RedCard is in her name anyway so it really cost me $3.79. What next happened was one of the most stunning things of my life. She opened the package and began to build it. "What are you doing!?" "I wanna build your set, is that okay?" "Um, uh, yeah, sure." I couldn't care less whether or not I was the one to build it, I was just floored that she wanted to. An AFOL she is not. After we got home I looked it over (fixed her one misbuild) and vroomed it around a bit. That's when the real disappointment set in. This was less a functional dozer and more a poorly designed pile of parts. My hands aren't fat and I'm fairly articulate so I won't blame it on me. For starters the roll cage continue to pop off. And not just the roll cage but the clips it is attached to. Even though the clips are 1x2 for extra grip, it's still not enough to contain the bulky load of the cage. Opening and closing it requires careful attention lest it pop right off. I know it's intended to be a small impulse set but a few extra parts to clamp the clips down would have been good. The bucket is a minor disappointment as it is difficult to actually scoop things up without the double articulation that is generally present. Must be a pusher, not a lifter. Still gotta get 4201 Loader and Tipper. The biggest disappointment to me is the hat. LEGO must have done something new with headgear. I'm not sure if it's present on other helmets as well but the anti-stud on the bottom has too much of a relief gap in it. If you sneeze at one of the mining minifigs their hat pops straight up off of their head Laurel and Hardy style. But at least we get an extra trans clear round 1x1 tile. Those are spiffy. If you are an OCD collector like me, certainly pick up the set. It looks good in a diorama or display. If you plan on letting your kids zoom it around be prepared for the thing to fall to pieces. I guess you can just pretend the dump truck ran over it.